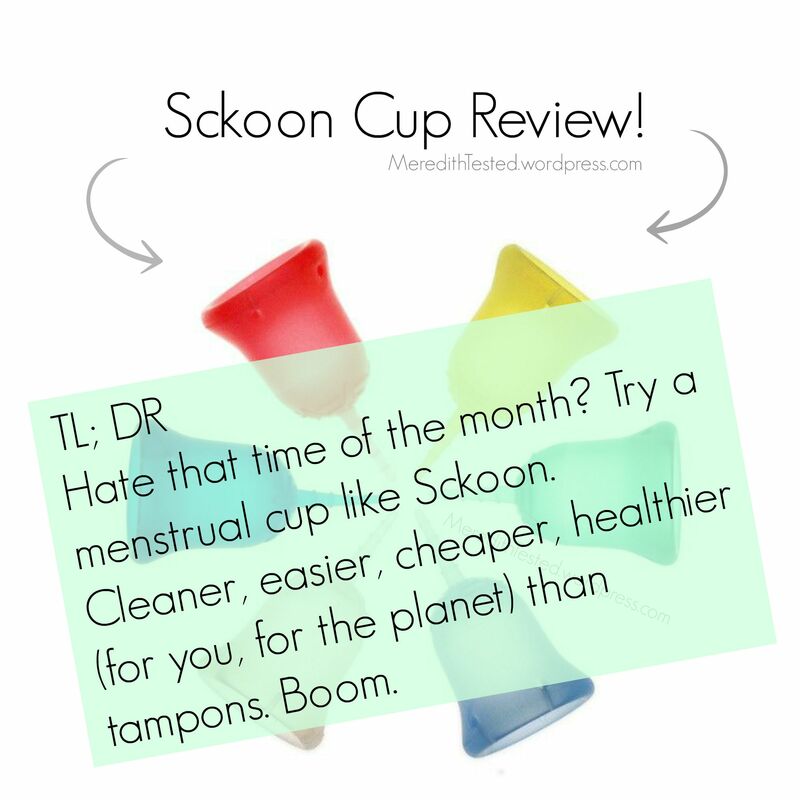 This is a review of the Sckoon Cup, yes, but it’s mostly a love letter to menstrual cups in general. I did a LOT of research on menstrual cups before I made my decision. There are women out there who have tried a lot of different brands and styles. I let them do the research so I would hopefully only have to buy one kind of cup to find true love. There are a lot of features women look for but comfort and ease of use are at the top of the list. Despite it’s slightly awkward name, the Sckoon cup seems to get high scores on a lot of features. So, this cup was on my list as a good option and when Sckoon ran a special discount for their Instagram followers, I pulled the trigger and bought one. I ordered my cup directly from the company* but they are also available via Amazon and other online retailers. This is the first cup I’ve ever tried. Spoiler: I l-o-v-e it. I cannot believe I’ve lived for so many years without it. Why was I ever squeamish about a cup when I’ve been shoving tampons (gross! toxic!) up there for so many years? It’s way easier than I thought and way less gross/painful/etc. than using disposable tampons or pads. …Because I have to change the cup so infrequently, I’m not constantly thinking about my period during the day. I can just live my life. I think that’s weirdly my favorite benefit of using a cup – I forget it’s even there. Let’s get this out of the way: Periods/menstruation can be messy and gross, no matter how you deal with it. If you’ve ever had a dog dig through your trash during that time of the month you know the horrors (HORRORS!) I speak of. If you’ve ever wondered where to toss your used tampon or pad in an awkward situation (at a friend’s house, work situation, camping, etc. etc.) you know what I’m talking about. The cup pretty much eliminates the worry in those situations. Ahh-mazing. So now that we know that tampons are gross, pads are gross, and bleeding for multiple days a month isn’t fun, let’s get on with it. Sckoon Cups are Made in the U.S. of A. of medical-grade silicone. The company cares about their products and your health. Huzzah! 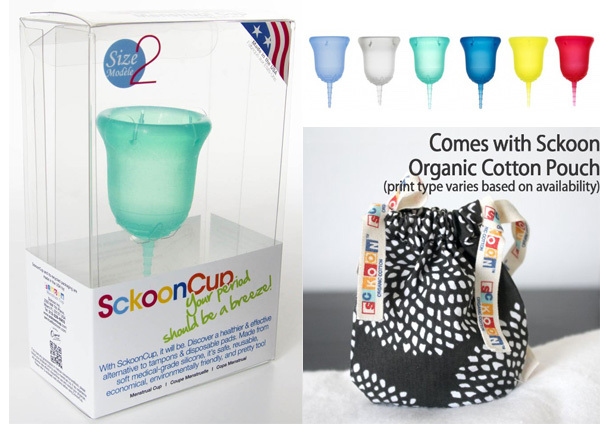 The Sckoon Cup comes in two sizes – if you’ve had a baby vaginally or not. You should be able to easily figure out which one you are. Right?! You can pick from several colors. Not that it matters. But, you know, it matters. Because colors. I chose Harmony – the teal greensih-blue one. Because it’s pretty, dammit. And red seemed too obvious, hahaha. But by all means go with red if that’s your style, lady! To remove the Sckoon cup, sit on the toilet (or squat) and grab the cup by pinching the bottom (there are little ribs there that make it easier to grip). Twist a bit to release the suction if you need to. Pull it out, pour the contents out in the toilet. Flush. Rinse first the cup with cold water, then wash with hot water and soap. Then fold it up again and re-insert. I have one or two heavy days where I have to empty more often. But typically it’s once in the morning when I get up and once at night before I go to sleep. YOU HEARD ME RIGHT. TWICE. Around 9am and 9pm. None of that “uh-oh” feeling multiple times a day. Or worrying that you’ve worn your tampon for too many consecutive hours. Wear a liner on your heaviest days, overnight, or all the time until you get comfortable with your cup and your body. Trust me, dealing with a liner for a few days will be worth it. Once you get your routine with your cup nailed down, you may only wear a liner for extra insurance overnight for 1-2 nights like I do. Once you’ve inserted the cup and it is open/feels suctioned, you may have to push it up a litttttle bit more. That helped me tremendously with fit and functionality. “Bear down” to make it easier to remove the cup. I can remove it by pinching the bottom and pulling it out but bearing down makes it quicker and cleaner. I learned this trick from the wonderful Kim at Dirty Diaper Laundry, I think. Pushing the cup down a smidge before pinching the bottom to remove was a revelation. Again, not that I couldn’t reach up and grab it no matter what, but bearing down just made it faster. If you’re still squeamish, I get it! I was you once! But WOW, once I got over the (very short) learning curve, I am kicking myself for not starting to use a cup sooner. It’s just so … clean. Weird, I know. Since you’re getting all up-close and personal with the … gross sh*t. But it’s seriously cleaner for me because I have to deal with it less. My time of the month, “Aunt Flo” or whatever you call it, is way less invasive and obnoxious now that I’m using a cup. This video was one of my favorites. It’s a little long but worth a watch if you’re considering a cup. Actually all of Kim’s videos are fun and informative. *Disclosure: Sckoon Cup has absolutely NO idea who I am, but I think they’ll like me. Right?! Haha. Anyway, I purchased this cup on my own and was not given anything in return for my review. I just want you guys to know about my experience. If I work with a brand or get something gratis, I’ll let you know.